Focus of the week: With the recent events that have unfolded in the banking sector, including the placing under receivership of three banks, we focus on corporate governance in Kenya. This week we broke ground on our Kshs. 3 billion development, The Alma, in Ruaka with CATIC of China as the contractor. The Alma. Our Partner and Chief Investment Officer Elizabeth Nkukuu discussed the opportunities in Kenyan Real Estate Sector on KTN News. Elizabeth Nkukuu on KTN News . Our Head of Private Equity Real Estate, Shiv Arora discussed Kenya?s banking sector and the roles of the CBK on Citizen TV. Shiv Arora on Citizen TV. Our Head of Private Equity Real Estate, Shiv Arora also discussed the banking sector developments on KBC News. Shiv Arora on KBC. Our Senior Investment Analyst, Duncan Lumwamu, discussed the developments in the Kenyan Banking Sector on KTN News. Duncan Lumwamu on KTN News. Our Senior Investment Analyst, Duncan Lumwamu discussed the placement of Chase Bank under receivership. Duncan Lumwamu KBC Channel One . Our Senior Investment Analyst, Duncan Lumwamu discussed the increased interest in the acquisition of Chase Bank. Duncan Lumwamu on CNBC Africa. Our Senior Investment Analyst, Duncan Lumwamu discussed the extension of liquidity support by the Central Bank of Kenya to local banks. Duncan Lumwamu on CNBC Africa. We continue to beef up the team with other ongoing hires. Careers at Cytonn. Treasury bills auctions saw an oversubscription this week, with total subscription rate coming in at 246.5%, compared to 178.5% the previous week, on the back of a liquid money market. Subscription rates for the 91-day and 364-day T-bills rose to 467.2% and 158.8% from 139.5% and 117.6%, respectively while 182-day subscription declined to 187.1% from 205.4% the previous week. The heightened subscription for the government securities is as a result of investors? flight to safety by holding risk free government securities after the placement of Chase bank into receivership by the CBK. The money market remained liquid with interbank rate rising marginally to 4.14 % from 4.11% the previous week. Liquidity in the market was as a result of (i) Central bank pumping money in the market through reverse repos of Kshs 16.2 bn, an increase of 230% from Kshs 4.9 bn the previous week as the CBK availed a facility to support the small banks facing a liquidity crunch, (ii) T-bill maturities of Kshs 10.8 bn, and (iii) Kshs 11.7 bn of government payments. Yields on the treasuries have bottomed out and we could see them oscillate around the current levels in the short-term. The flight to safety by depositors will also inject extra liquidity in the market, reducing upward pressure on rates. The shilling strengthened slightly against the dollar during the week closing at Kshs 101.2 from Kshs 101.3 the previous week as dollar demand ebbed. The shilling has appreciated by 1.0% on an YTD basis, and we expect the shilling to hold stable against the dollar on the back of (i) improved forex reserves currently at USD 7.4 bn, equivalent to 4.9 months of import cover, (ii) approval of an increased precautionary facility by IMF amounting to USD 1.5 bn, and (iii) improved diaspora remittances. However, in the short-term, as we enter into the dividend-paying season, which may result into an increase in dollar demand by foreign investors seeking to expatriate their dividends, we expect mild downward pressure on the Kenya Shilling, which may lead to slight depreciation. The government is issuing a 5-year FXD 1/2016/5 bond to raise Kshs 20.0 bn for budgetary support. Given (i) relatively stable and low interest rates and with the 5-year bond currently trading at yields of 13.9% in the secondary market, and (ii) relatively high liquidity in the money market, (iii) stable Inflation at 6.5% that is within the CBK band, (iv) a stable shilling, and (v) Government being ahead of its borrowing schedule, we expect rates to remain in the current range. In addition, after the placement of Chase bank under receivership, investors are fleeing to safety by holding government securities hence the bond is likely to attract strong interest from the investors. We recommend investors to bid at a yield range of 13.0% - 14.0% for the bond. Improved security and political stability following the termination of ICC cases facing the Deputy President that has reduced ethnic tensions as election approaches. However, Kenya fiscal deficit remains high at 8.5% of GDP in 2015/2016 as a result of high capital intensive projects such as the SGR and the economy remains vulnerable to exogenous pressures with external debt rising to 42.3% of the GDP. The S&P consideration gives positive sentiments on Kenya credit risk as the government plans to issue a Eurobond. We expect GDP growth to come in at 5.8% in 2016. According to the World Bank, Sub-Saharan Africa (SSA) GDP growth in 2015 slowed by 150 basis points to 3.0% from 4.5% growth recorded in 2014 marking the lowest growth since 2009 following the global financial crisis. The decelerated growth in the region is attributed to (i) the commodity prices rout in 2015 since fuel, ores and metals constitute more than 60% of the region?s exports, (ii) weakened economic growth in the trade partnerships countries, especially China that accounts for 22% of the region?s total trade, and (iii) adverse domestic developments in large economies is SSA such as Nigeria on the back of foreign exchange restrictions and security turmoil, while South Africa experienced high unemployment rates and interest rate hikes. The World Bank further lowered 2016 GDP forecast for Sub-Saharan Africa by 100 bps to 3.3% from the previous 4.4% October 2015 estimate as the aforementioned factors are expected to persist into 2016. Moving forward sub-Saharan economies will grow supported by: (i) economic diversification by reducing overdependence on revenue from natural resources, (ii) embracing urbanization and improving infrastructure to support Africa?s agricultural sector by providing a market for agricultural produce, and (iii) embracing technology to enhance value addition for commodities export. The government is way ahead of schedule with its domestic borrowing programme, having borrowed Kshs. 231.5 billion for the current fiscal year compared to a target of about Kshs. 155.1 billion (assuming a pro-rated borrowing throughout the financial year of Kshs. 219.0 billion budgeted for the full financial year). Interest rates have been on downward trend week on week since the start of February due to (i) reduced pressure on government borrowing, and (ii) high liquidity in the market. The government will continue borrowing locally to support the external financing deficits to date and the expected shortfall in collection by KRA. However, we note that the recent efforts to source for external funding by the government will boost external funding target, reducing the overall local borrowing pressure. With Interest rates coming down, we advise investors to lock in their funds in short to medium-term papers, tenors of between six months and one year, as the rates are higher on a risk-adjusted basis. During the week, the market was on a downward trend with NASI, NSE 20 and NSE 25 losing (0.3%), (2.0%) and (1.1%), taking their YTD performance to 0.3%, (3.0%) and (0.5%), respectively. Despite Safaricom edging up to an 11-month high of Kshs 17.30, the indices declined this week on the back of losses in the other large cap stocks such as BAT and EABL which lost 3.1% and 5.3%, respectively and a general decline in majority of the banking stocks. The top movers for the week were Equity, KCB and Safaricom accounting for 76.5% of market turnover, while Safaricom recorded the highest net foreign inflows of USD 0.3 mn, with EABL having the highest net outflows of USD 0.3 mn. 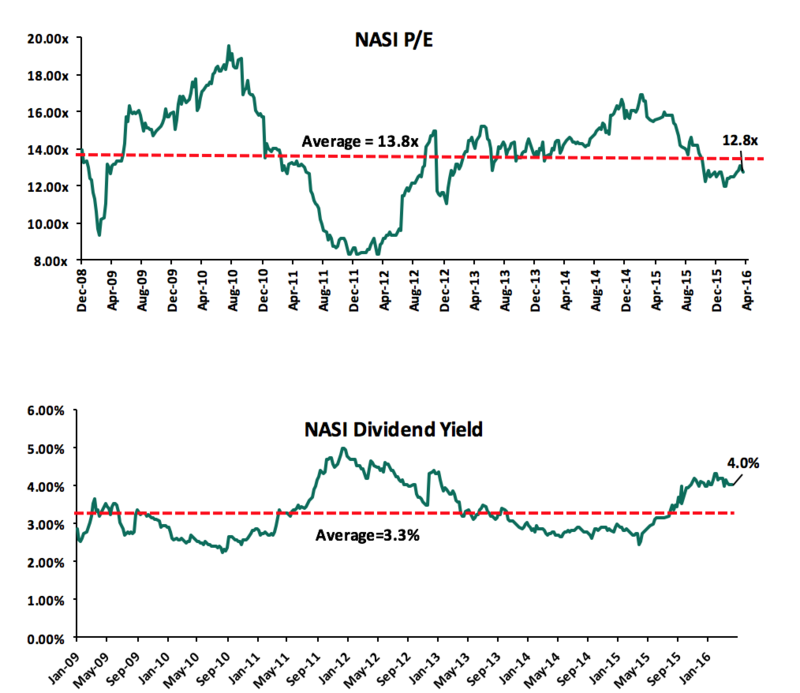 Since the peak in February 2015, NASI and NSE 20 are down 17.5% and 27.3%, respectively. Equity turnover fell by 18.4% during the week to USD 19.9 mn from USD 24.5 mn last week. Foreign investors were net sellers with net outflows of Kshs 77.0 mn compared to net outflows of Kshs 68.0 mn last week. Foreign participation dropped to 66.7% from 72.3% last week. The market is currently trading at a price to earnings ratio of 12.8x versus a historical average of 13.8x, with a dividend yield of 4.0% versus a historical average of 3.3%. Centum, the single largest shareholder with a 31.3% stake in Longhorn Publishers intends to take up its rights in the upcoming rights issue at the current offer price of Kshs 4.2, a 12.5% discount from the current price of Kshs 4.8. Of the 126 million new shares on offer, Centum plans to spend about Kshs 390 mn to take up about 50% of the offered rights, which will effectively take its shareholding in the firm to about 51%. The company does not however plan to take over the control of the NSE listed firm. Longhorn publishers currently has contracts to supply text books and learning materials worth Kshs 856.4 mn to regional governments and Centum eyes growth and attractive returns in the educational sector having recently bought a Kshs 10.2 mn stake in Elimu Tv, a television station that provides the secondary education curriculum. Longhorn Publishers intends to (i) bolster its working capital position by at least Kshs 100.0 mn, (ii) spend at least another Kshs 50.0 mn on the creation of digital learning material and developing proprietary e-learning platforms as part of its drive towards digital educational content, (iii) invest Kshs 100 mn in product diversification, (iv) pursue regional expansion at a cost of Kshs 80.0 mn, having just opened an office in Rwanda last year with plans to cross-list on the Dar es Salaam Stock Exchange, the Uganda Securities Exchange and the Rwanda Stock Exchange, and (v) pay up a Kshs 100.0 mn debt it owes Nabo capital, another of Centum?s subsidiary. In line with its 3.0 strategy, Centum?s investment into Longhorn will see it expand its focus in the education sector and we expect this to contribute positively to its revenue, going forward. Pan Africa has moved to a ?Lighten? from ?Accumulate? following a 14.8% price increase week-on-week driven by increased local demand. Jamii Bora Bank Limited has acquired debt funding of Kshs 1.2 bn from Equator Capital Partners and Progression Capital Africa Limited. The third tier bank which currently has over 400,000 customers and a network of 26 branches across the country is looking to use the funds to grow its rural and urban network and also increase its capacity to lend in the SME sector. Jamii Bora is looking to raise a total of Kshs 5.0 bn in a mix of debt and equity and has already raised the debt component of Kshs 1.2 bn. The company is looking to raise the remaining Kshs 3.8 bn in equity funding. Equator Capital Partners are investing through their USD 80.0 mn Shore Cap II Limited Fund established in 2009 based in Mauritius. Equator Capital Partners investment prospects involve a 5%-25% stake for USD 3.0-12.0 mn. Progression Capital Africa Limited have invested through their Progression Eastern African Microfinance Equity Fund which invests USD 2.0-8.0 mn in financial inclusion through financial technology companies. Moving forward, as banks look to increase their capital buffers to meet the regulatory requirements and grow their network base, we expect further consolidation within the Kenyan banking industry, supported by private equity investments. Private equity investment in Africa remains robust evidenced by the increase in deals and deal volumes in the region especially in financial services, energy, FMCG, real estate and technology sectors. Given (i) the abundance of global capital looking for opportunities in Africa, (ii) the attractive valuations in private markets compared to public markets, and (iii) better economic growth projections in Sub Sahara Africa compared to global markets, we remain bullish on PE as an asset class in Sub Sahara Africa. Kenya?s 23rd Homes Expo themed ?Creating Tomorrow?s Lifestyles? was held this week at the KICC, Nairobi. The event has played a significant role in shaping the real estate industry through bringing together various industry players who use this platform to exhibit their diverse products and services. The event, which attracts more than 30,000 visitors, provides a one-stop shop for aspiring home-owners as new products, innovative designs, technology and different financing options are showcased. Kenya?s housing market is thriving on the back of strong economic growth and a burgeoning middle class ready to invest in new homes. While adoption of new building technologies is still low, we expect an increased uptake as the market is enlightened through such events. We also expect healthy competition among market players as firms get to see new innovations and trends, and work to keep up. Nairobi continues to be a regional business hub for East Africa, and is one of the global cities well positioned to gain from the growing popularity of short-let accommodation. The Knight Frank Global Cities Report 2016 indicates that multi-nationals are more cost-conscious and deploying people for shorter periods, thus relying more on serviced apartments than hotels. The most sought accommodation locations are in Kilimani, Upperhill and Westlands. Our research shows that serviced apartments in Westlands have a high occupancy of up to 90% generating a yield of up to 8.7% annually, compared to serviced apartments in Kilimani which have an average yield of 7.0% as indicated in our report Kilimani research report. The main factors driving demand for serviced apartments in these areas include proximity to Nairobi CBD, proximity to major office nodes, good transport network, security and proximity to shopping centres and social amenities. In line with these, we saw Chinese investors launch an 11-storey serviced-apartments project in Kilimani dubbed Soho Apartments. The Kshs 1.8 bn project is targeting business travellers, tourists and multi-national workers visiting Kenya for short periods of between 3 to 12 months. Our development affiliate, Cytonn Real Estate, has also recently acquired land in Westlands and is actively evaluating potential diversification into serviced apartments business given the strong occupancy rates and yields in the area. In our view, the influx of serviced apartments may set back hotels, especially those heavily relying on business travellers. This is because these apartments provide a guest with amenities similar to those of a hotel such as house-keeping, conference space and restaurants while still providing the comfort of a furnished home. In order to keep up, hotels, such as the Ole Sereni Hotel on Mombasa Road, are diversifying their offerings by incorporating a rental option through building of serviced apartments thus giving visitors a wide array of accommodation options. Mount Kenya Holiday Homes signed an agreement with Swiss International for the development and management of a 75 suite 5-star hotel in Naromoru. The entry of the global hoteliers into the Kenyan hospitality market, under a Kshs 70.0 bn worth of partnership, is on the back of the scenic foothills of Mt Kenya and the surrounding wildlife sites in Nanyuki, Nyeri, Isiolo and Samburu. The resort whose construction began 4 years ago and comprises of a total of 281 villas, apartments, townhouses and the 5-star hotel, has now acquired a new brand name ?Swiss International Resort Mt Kenya?. Entry of the globally renowned hotelier into the Kenyan industry shows confidence in the country as a local and international tourist destination. A report recently released by W Hospitality ranked Kenya as the best country in East Africa and 7th in Africa in the field of hospitality. Improved security in Kenya, followed by lifting of travel advisories has led to a recovery in the number of tourists visiting Kenya, thus creating demand for hotel rooms. Kenya boasts of more than 6 global hotel chains among them, Hilton, Kempinski, Radisson Blu, The Tamarind Group, Hemingways and Park Inn by Radisson, with 2,956 rooms in the development pipeline. This data indicates that despite the setback brought about by insecurity and terrorist attacks in 2014 and 2015, Kenya remains resilient and has potential for further growth. The government?s commitment to improve tourism through enhanced security and expanding airport infrastructure will increase the number of visitors to Kenya and thus boost hotels development. When the Capital Markets Authority, ?CMA? published a ?Code of Corporate Governance Practices? last month, we did a focus note on Corporate Governance in Kenya . In that focus note, we highlighted instances where potential corporate governance malpractices may have contributed to significant loses to the investing public to the tune of approximately Kshs. 257.0 bn. We then made suggestions on how to improve corporate governance. In this note, we update the count of recent losses due to corporate governance, we then review how we can improve corporate governance in this market and highlight our upcoming Corporate Governance Index. Since the March 2016 article, we have had two more instances of significant investor loses that are primarily about corporate governance and ethics - the collapse of Chase Bank and the management changes at National Bank of Kenya (NBK). Not even considering any potential depositor losses, Chase Bank bond holders currently have Kshs. 4.8 bn at risk and NBK shareholders have lost Kshs. 2.0 bn in total value since the recent peak of Kshs 16.0 per share in November 2015 to the current Kshs 9.20 per share. Total number of companies that have incurred investor loses relating to corporate governance now comes to 8: previously we had CMC, Imperial, Uchumi, Mumias, Kenya Airways and TransCentury, and now Chase Bank and NBK. The estimated potential losses to the investing public now amounts to roughly Kshs. 263.0 bn. This trend threatens the health of our financial and capital markets, which are essential to the wealth and livelihoods of many Kenyans invested in these markets, and also threatens businesses that depend on these markets for funding. As seen in the most recent occurrence, isolated cases such as Chase caused a crisis of confidence in the entire banking industry, stopped access to Kshs 94.3 bn of deposits and has cut funding and services to enterprises that relied on Chase for running their business. In an economy with a GDP growth rate of about 6.0% per annum, investors should not be experiencing such significant widespread losses, and the prevalence of corporate governance issues that is affecting almost 10% of listed securities should worry us. All market participants including investors, regulators and corporates need to do their part in addressing the crisis of corporate governance in our private sector. Corporate governance constitutes the mechanisms, processes, and relations through which companies are controlled and governed. Corporate governance is founded on the pillars that businesses have to practice accountability to stakeholders, fairness, have transparency in business activities and exhibit independence in decision making of the board. The benefits of good corporate governance are numerous as (i) it protects the interest of the investing public, (ii) improves access to funding at better costs, (iii) reduces risks of corporate crisis, (iv) improves firm valuation and share price performance, and (v) generally improves the performance of the entire firm and enhances sustainability. First and foremost, is integrity and ethical behavior of all market participants. Most of the corporate malpractices in Kenya are not due to poor judgement or mere underperformance by boards and management. They can be traced to ethical issues and conflicts of interest where the board and management made decisions that are selfishly focused on benefitting themselves rather than prudently running the company. Specifically, boards and management should never do business with their company, such as supplies and tenders. Top management should never engage in any business that competes with their company and should always declare all other businesses they are engaged in while occupying the position of executive management. Professional ethics: All cases of unethical practices, such as irregular loans to shareholders and insiders, unsecured loans to influential borrowers, kickbacks to managers allocating to banks corporate deposits could not have happened without the knowledge of key professionals within organizations. Beyond boards and CEOs, senior management around them need to take their professional obligations seriously. Regulatory independence coupled by firm but fair enforcement. There is a market perception that some market participants are not playing by the rules given their connections with regulators and law enforcement agencies. We have heard allegations of Imperial Bank management having compromised regulatory staff and regulators in some instances are also market participants. Regulators are the referees in the public investments game hence, we cannot have a vibrant financial market without an independent, firm, fair and transparent regulatory framework. Investors have to take governance seriously and factor it as part of their investment decision process. Investors have to ask themselves questions such as, is the board competent? Is the board and management diversified? Is there a strong management team around the CEO? What is the track record of the board and the management? What is the tenure of the CEO - are they changing too quickly, on the other hand, have they stayed in office too long? For example, the tenure of the Imperial Bank CEO, for 22 years, and the lack of diversity on TransCentury?s board, could have raised red flags that should have invited investors to further scrutiny. Board oversight and competency: Boards need to ask themselves whether they truly understand what is going on in the company and practice healthy skepticism of what management is telling them. In the case of Imperial, the board itself claims that they were not aware of the malpractices in the company. In the case of Kenya Airways, one wonders whether the board truly understood the implications of the aggressive expansion strategy that management was pursuing. The case at Chase bank, where the board was full of sophisticated global markets private equity investors, is puzzling because one would have expected them to have detected the issues early. Each board member needs to seriously ask themselves this question: ?Do I really understand what is going on in this company for me to be able to effectively play an oversight? Can I explain all the key changes in the financial statements?? Following the recent developments that are largely driven by failures in corporate governance, we have constructed an index to rank companies according to the effectiveness of their corporate governance framework. We rank companies using 25 metrics that monitor a company?s operations in the aspects of (i) strategy execution, (ii) risk management, (iii) director and management discipline monitored through evaluations, (iv) transparency, (v) independence of board members, (vi) responsibility and accountability of management and directors, (vii) fairness towards shareholders and other stakeholders, and (viii) participation in social responsibility activities. The components of the index and the respective scores are currently undergoing review and discussions with the participants prior to release. Good corporate governance is essential to well-functioning and vibrant financial markets, and vibrant financial markets are essential to funding economic growth, which in turn creates jobs and raises the standards of living for Kenyans. Consequently, good corporate governance is a national imperative and we have a choice: we either focus on it and get it right for the benefit of all Kenyans, or give it lip service for the benefit of a few unscrupulous players.